We are kicking off a new week of Virtual Book Club for Kids and we are spotlighting Little Cloud by Eric Carle. We will spend the whole week reading Weather themed books and doing some simple crafts and activities. My kids spent yesterday evening making cotton ball clouds inspired by Little Cloud and exploring their shapes. As the activity progressed, they deviated into creating clouds with rainbows. The creative process was beautiful and it was fun to see the different ways they chose to paint! My favorite was blow painting! 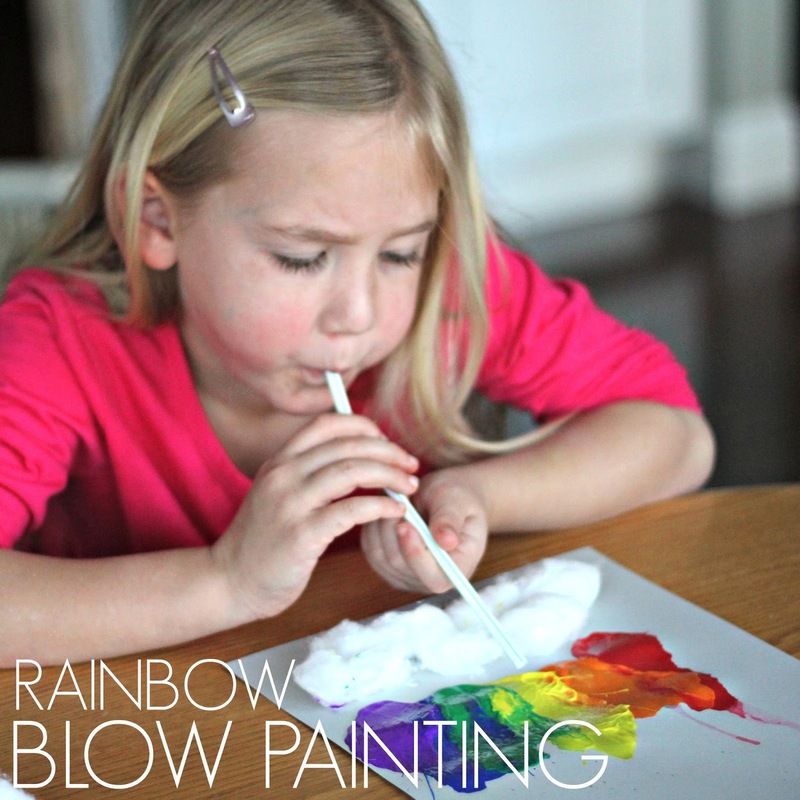 We've done it before, but rainbow blow painting was even more fun! 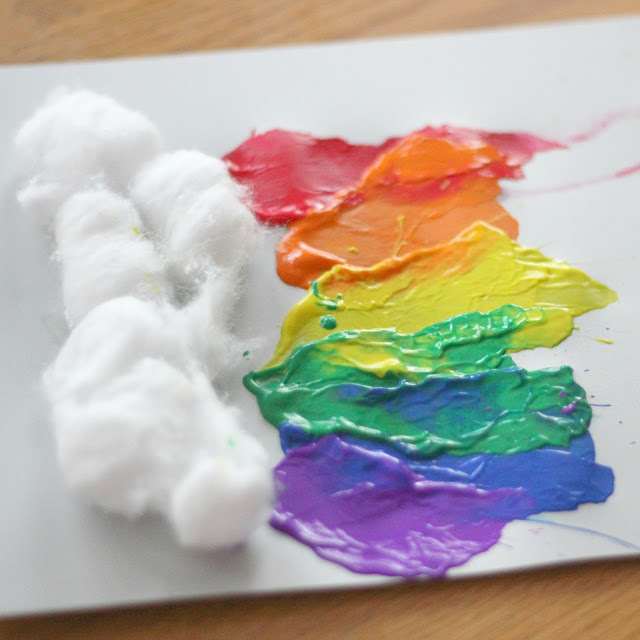 Making cotton ball clouds is an easy activity if you have free time, glue, and a bunch of cotton balls. If your kids are like mine and like rainbows, blow painting is a fun activity to pair with your cotton ball clouds! You can blow white paint all over or use rainbow like we did! Put each type of paint in a little cup. Mix with a little water to thin each paint color. Glue cotton balls onto your paper to make clouds. As you read Little Cloud, talk about your favorite cloud designs and use them as your inspiration. Next drop paint onto your paper using a spoon. 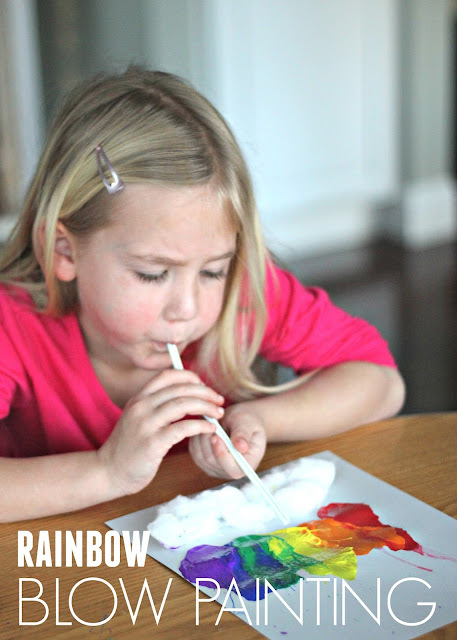 Use the straw to blow the paint across your paper to start your rainbow. The thinner the paint, the further it will blow. Have kids test blowing high, low, hard, soft, etc. as they do it. After you try one color, add a spoonful of a different color and continue adding until you have all of the colors of the rainbow! We fit as much paint on our paper as we could! Some clouds don't even need a rainbow, they can just have a blow painted sun! My oldest loved blow painting by adding all of the rainbow colors in one big blob in the middle of the paper and then he started blowing outward from there. All of the creations were beautiful, but the process was the most fun! I loved watching a spark of curiosity turn into a colorful creation. I loved watching gears turn in little heads while kids explored the materials I had set out. I had so much fun creating alongside with my kids and getting a bit messy! After all of my reminders to keep their sleeves pulled up and shirts away from the table, I noticed that I had purple paint all down my white shirt, sweater and skirt! LOL. Next time I need to dress more appropriately for painting! Good thing we were using washable paint! Have you tried blow painting before? Do you have any other favorite ways to create clouds or make rainbows? Our Weekly Virtual Book Club for Kids co-hosts have a lot of fun weather themed activities and crafts for WEATHER WEEK! Check out the ideas below by just clicking on each link to see more details! Don't forget to check out some of our favorite Weather Week books below as well, including our featured book, Little Cloud by Eric Carle.